Many spinners today prefer to buy their wools already processed and ready to spin. Part of that is undoubtedly because it's fast and easy--"instant gratification". But partly it's because washing wool has a bad reputation: It's difficult, smelly, messy, hard to avoid felting, etc. When I started spinning, there were very few prepared fibers available to spinners, and I knew of no custom carding mills. So I had to learn, through experimentation, good methods of washing wool (sometimes by making really bad mistakes!). Fortunately, one of the first full fleeces I bought was a very fine wool. So I had early experience in washing fine wools effectively and learned to not be afraid of it. Washing your own wool can make sense today. Even if you don't raise the sheep your wool comes from, it can be hard to resist the beautiful, if greasy, fleeces for sale at fiber shows, for example. Then you get that lovely wool home, look at it lurking in its bag or box, and wonder how to get it to spinning condition! Or you wonder how best to wash it, so you can save on shipping and processing charges, and often turnaround time, if you decide to have it commercially processed. Hopefully this article will answer all your questions. Washing wool isn't nearly as hard as it may seem. Really! If you're familiar with the whys and wherefors of washing wool, try my Summary of Washing Raw Wool to save time. The biggest fear most spinners have is the possibility of felting the wool. Felting occurs when the wool is exposed to some combination of the following factors: The wool is wet, is agitated, is exposed to heat, or is exposed to an alkali pH. Obviously wool must be exposed to water to wash it, and equally obviously the water must be hot to dissolve all the grease. But if agitation is held to a minimum and detergent is used rather than soap, which is often alkali, felting will be minimal if it occurs at all. Warning! Do NOT use a front-loading washing machine to wash your wool unless you really, truly want balls of felt! Top-loaders are fine if you make sure water doesn't run onto the wool at any point--remove your wool as the tub fills. Note: I’ve recently been told some front-loading machines have wool cycles that can be used to wash raw wool. I’m rather leery of it until I see it, but if you have a front-loader with a cycle for washing wool clothing, and a little fleece that needs washing which you’re willing to sacrifice, do let me know how it goes! To be extra safe when washing very fine wools, or to minimize waste when you're planning to handcomb the washed wool, sausages work very well. Another problem many spinners are not aware of is the possibility of the water not being hot enough, or there isn't enough detergent, to fully remove the grease in the wool. A fleece can feel quite clean when dry, only to become more and more sticky and stiff to the touch over the days or weeks after washing. This stickiness can make the wool hard to spin, and it attracts dirt which is then difficult to wash out. And cottage carding mills typically must charge to rewash sticky wool, if you later wish to have the wool machine carded. This problem is readily solved by using enough detergent and water that is really hot the first time it's washed. Ideally, the wool will have been fully skirted before you buy it, but it's well to look it over carefully so you don't waste your time washing poor quality wool. If you skirt a lot of wool, building a skirting table is a good idea. At its simplest, it is just a framework with screening of some sort attached, placed on a stand, upon which the fleece is laid for skirting. Much of the debris will fall right through the table. If the screening is rust-proof, the table can be used for drying the fleece after washing. The next step, and the most important in avoiding felting, is to place the wool in some sort of mesh bag--before it hits the water. This could be a bag used to ship potatoes or onions, for example. If you use bags that have actually been used to store onions, turn it inside out to avoid onion skins mixing with your wool. Small bags work for small quantities of wool, such as a pound. To wash an entire fleece, use several medium bags or lightly pack large bags rather than putting the whole fleece into one huge bag which will hold eight or nine pounds of wool. It takes time for the wash water to penetrate to the center of the wool. If the wool is too compressed or simply too thick because it's all shoved in one bag, the water may not penetrate enough to get the center of the mass really clean. Another concern is that there is space enough in your wash tub, bucket, sink, top-loading washing machine, or other receptacle for the washing process. One large bag may not fit, while several smaller ones can be washed in batches suitable to the size of the container. I find I can put about six lightly loaded bags, each of the size used to hold 50 pounds of onions or carrots, into my large-capacity top-loading washing machine, to wash a total of about eight pounds at one time. If the wool is particularly encrusted with mud, don't give up on it. Give this wool a cold water soak (in its bag, of course) for a day before washing it--no detergent is needed in this presoak. Much of the mud will soften and rinse away. You will have noticed that space is an issue when washing wool. If the water and detergent can't move through the wool, the wool won't get clean. At the same time, if the water moves too much through the wool, felt may result. The bags can be fairly full, but not crammed, to prevent felting and allow good cleaning. Now it's time to start your wash water. First, check the temperature of your hottest tap water. It should be at least 140 degrees Fahrenheit for coarse wools, and at least 160 degrees for fine wools. Lower temperatures are very likely to result in some of the grease being left behind in the wool. I wash a lot of wool, so I keep my water heater set higher than most people. I then augment it with kettles of boiling water, if needed, for fine wool washing. Don't underestimate the importance of really hot water when washing wool. Many authorities state temperatures as low as 110 degrees F will work. Maybe, in some situations where the fleece is not very greasy and is just shorn. But if the wool sits around for a time before washing, the grease begins to harden and is resistant to melting in the water. Also, fine wools have a waxy substance in addition to the lanolin, which needs a higher temperature. It's not possible to have the water be too hot in a home situation, as long as you don't use a pressure cooker on your wool! When you remember that the more times wool is handled in hot water, the more likely it is to felt, it makes good sense to use the hottest possible water right from the start, to minimize the number of trips needed through the water. A variety of containers can be used for washing wool. Dyepots, sinks, tubs including bathtubs, buckets, and even your washing machine (top loaders only!) can all be used. The washing machine is certainly the easiest when washing wool, but also must be watched more carefully to make sure that water doesn't pour onto the wool while the machine fills, and that it doesn't agitate while your wool is soaking. Have I had that happen? Yes! Learn from my mistakes and never, ever assume your machine won't agitate with wool in it. Note: Some people warn against washing wool where the dirty water will go into a septic system. They say that the lanolin will redeposit in the septic tank and clog up the tank. My personal feeling is that the amount of detergent added to the water is crucial in keeping the grease in suspension. If it works for greasy dishes, why shouldn't it work for greasy wool? I first moved into a house with a septic system in October of 1997. We have not had any problems in our system due to washing wool and allowing the waste water to go down the drain and into the system. Only time will tell if this is OK. If you feel uncertain, you may want to find a different way to deal with the waste water from washing wool. Please be aware many areas have laws concerning the disposal of waste, or gray, water, and check with your local Health Department before proceeding. Another problem mentioned by some is the possibility of the septic system or drains or both being clogged with loose bits of wool. I haven't seen this happen, but I bag my wool for washing, and never wash it after carding (wool tends to stay in the lock formation even when wet). If you don't bag your wool, you might want to look over your drains to see if some sort of mesh can protect them from wool clogs. So, you've filled your container with really hot water. Now it's time to add something to the water to bond with the dirt and grease. We wait to add the cleanser after the container is filled with water so we don't raise a lot of suds, which are hard to rinse out of wool. Traditionally, soap has been used and recommended in older spinning books. Unfortunately, soap sometimes has an alkali pH, and alkalis can damage wool, making it more prone to felting and harsher to the touch. It's also much less effective in hard water, leaving soap scum behind. A vinegar rinse, widely suggested as a sort of antidote to soap, may 'cut' the soap residue on the wool, but will not reverse any damage done by an alkali pH. Although our foremothers had no alternatives to soap, today we have a tremendous selection of detergents, which are neutral or slightly acidic in pH--both are fine for wool. They also have the advantage of not combining with minerals in the water to make soap scum on your wool or wash container--no vinegar rinse necessary. There are still some pitfalls, however. Laundry detergents seem like a logical choice, but are not necessarily a good one. Most laundry detergents contain "whiteners and brighteners" which can permanently affect the color of your wool, even if later it's dyed. In my experience, too, laundry detergents don't cut the grease very well--most clothes aren't very greasy, after all--and also harshens the feel of the wool compared to other detergents. I suspect the latter is because they're formulated to wash cottons primarily, which loves alkali but hates acid. I recommend against laundry detergents. There are a variety of shampoo-like detergents some spinners use, formulated for washing wool, or for washing animals--even human shampoos have been used in washing wool. I find these products to be expensive and not terribly effective. There's a product called EcoScour that's being used in quite a few commercial carding mills. It's probably very cost-effective and well-designed for wool washing, but I find it has a penetrating odor that gives me headaches rather quickly, so I don't use it anymore. Contact your favorite carding mill to see about how to find this product if you want to give it a try. Finally, my recommendation! I use liquid dish detergent exclusively. It's very readily available, relatively inexpensive, and if enough is used, in hot enough water, it's very effective at getting all the grease out of the fleece. I've tried a variety of brands. I personally have come to prefer Dawn, but have also found local 'no-name' brands almost as effective, so you can choose what you like best. Be very sure you don't choose dishwasher detergent. These are very harsh, often very alkali, and will damage your wool extensively. Hand dishwashing detergents are designed for people's hands to be immersed in--anyone remember the old Palmolive commercial with "Madge" the manicurist? I wouldn't recommend you soak your fingers in such detergents undiluted, but it's certainly designed to not damage protein-based human skin, so it's not going to hurt the protein-based sheep's wool. How much detergent do I add? I use about one full measuring cup (250 ml) of detergent for every two pounds of wool. Yes, that's a lot! But I've had problems with fleeces feeling sticky later on when I've used less. It's better for the wool to use too much detergent than not enough, and have to wash and rinse all over again. At the very least, add enough detergent to make the water feel slick. Stir it in very gently, or briefly agitate on a very gentle cycle. Don’t raise suds, or you’ll be spending a lot of time rinsing them out. We are finally ready to add the wool to the wash water! With your wool in some kind of mesh bag, lay it on top of the hot water and detergent, and gently, slowly, immerse in the water by pushing down on it with a stick or something similar--don't use your hands unless you're wearing rubber household gloves, the water will burn you! If you were careful not to raise suds when you added the detergent, the wool should immerse quickly and easily. If the water is very sudsy, you may have to hold the wool down with your stick or a weight until it's wet through. Remember to be gentle, agitation is how good felt is made! Let the wool soak in the water for a time. How long? Long enough for the water to thoroughly penetrate every part of the mass of wool, but not long enough for the water to cool. If the water goes below 160 degrees for fine wools, 140 for coarser wool, the grease may begin to redeposit on the wool, more likely if you didn't use enough detergent. Probably 15 minutes will suffice for coarser wools in quantities of a couple pounds or so. A bit longer for finer wools, or larger quantities. I seldom need more than half an hour. If you want to wash several batches of wool without having to dump out your wash water, add a good amount of additional detergent each time, and some boiling water, to keep the temperature up and the detergent sufficient to latch onto dirt and grease. Don't assume anything about the temperature--measure it with a thermometer. I've even wrapped a bucket in a wool blanket, to help keep it hot! If you are using a top-loading washing machine, you probably can wash an entire fleece at one time, depending on the size of your machine and the size of the fleece. You will need a lot of detergent, and do check the temperature of the wash water. Some washing machines mix cold tap water with hot tap water when filling, even when set to 'hot'. Your wool has soaked for a time, and you want to take it out. If you're using a washing machine, you can spin out the wash water without hurting the wool, even very fine wools. If you're using some other sort of washing receptacle, you'll have to lift the wool out of the water. It will be hot and heavy, so be careful. It's a good idea to wear rubber household gloves at this point, to protect your hands. If you fold up their cuffs slightly, you can also keep water from running down your arms as you work. Have ready a place you can set the wool to drain if you couldn't spin it out. Either in an empty bucket, tub, or sink, or on a draining rack of some sort. Draining allows much of the dirty wash water to leave your wool before beginning to rinse it. I like to let my wool sit for at least 10 minutes to drain, but if I'm in a hurry and I have the rinse water already prepared, I do sometimes place the wool, still in its bag, in the rinse water without draining first, but this guarantees more suds to rinse out. Spinners are commonly warned to not change the temperature of the wool too abruptly, for fear it will cause felting. I find this to not be a problem. Using my washing machine, I go from hot wash water to a warm rinse (about 110 degrees F) to cold (directly from our well, under 50 F). Yes, even Merino and other very fine wools can handle that change of temperature, provided they are protected from agitation. If the wool is still bagged, it will be fine. If I must use the same container to rinse my wool as I used to wash it, I first dump it out and rinse it well. I then fill it with warm water, 100-120 degrees. I put the wool in the water as before, but it can be quite a struggle to submerge the wool this time, as it's full of suds, no matter how careful I was to avoid the problem earlier. Basically, I end up just dunking the wool, slowly and gently of course, several times, then I let it sit on the surface of the water to cool for 15 minutes or longer. I give my wool a second rinse, which is more effective than the first as the vast majority of suds are now gone. Cold tap water is fine at this point. A top-loading washing machine is very handy during all the drain and rinse phases, as you can spin out the wash and rinse waters while the wool is in the machine. Yes, you can, and it won't felt even fine wools. After spinning out the water, remove the wool before refilling the machine. You can also use other methods to wash the wool, saving the machine for spinning out, or for final rinsing of several batches of wool. I often do than on dyeing days--I rinse all batches of dyed wool at one time at the end of the day, having washed the batches individually as soon as they were dyed. Drying wet wool is another task which has a bad reputation. One 'rule' I've heard is "Don't dry your wool in direct sunlight!" Well, where were the sheep for the year before they were shorn? As with many endeavors, drying wool yields to an exercise of common sense. The fastest way to dry wool is set it outside, in the sun, on a surface of netting or something else 'holey', on a warm and breezy (but not too windy!) day. If I turn it once or twice, I can get an entire fleece dry in a couple hours. The only concern I have is to not place the wool where birds might 'drop in'--a much greater hazard than sunlight. If that's a real problem for you, put a sheet loosely over the wool, anchoring the corners to keep it from blowing away. A drying rack, similar to a skirting table, greatly speeds wool drying whether indoors or out. Fish netting, nylon netting (illusion or tulle), those potato or onion bags, nylon window screening, chicken wire, etc, can be attached to some sort of lightweight framework, and then given legs or set on top of supports. If you make something of this sort, consider where you are most likely to dry wool in the wintertime, too. Over a bathtub, for example? Then make sure you build it to fit that area, and make it small enough to be portable indoors. At one point I had a drop-down rack attached inside the door of our tool shed--that worked fine, but wasn't as convenient a location as others I ended up using, but it could be implemented other places, even inside a studio. If you don't have a rack, wool will dry, indoors or out, draped over whatever reasonably clean surface is handy. Porch railings, deck chairs, picnic tables, fences when outside; looms, chairs, card tables, drying racks inside. Another no-no I've been told is to not place wool on or near heating vents and radiators, but I've dried wool successfully--and very quickly--in both places. Just don't use your clothes dryer's interior! Wet wool, tumbling in the dryer, will felt. But if you're washing and drying clothes, and the top of the dryer is warm and not too dusty, that's another good place to dry your wool. When the wool no longer feels cool to the touch, it's dry enough to work with or store. Your wool is now dry--what comes next? If you don't plan to use your clean wool right away, it's a good idea to store it in a closed, but breathable, container, away from direct sunlight, heating/cooling vents, or areas that are subjected to extremes of temperature. Attics and garages are not great choices, and basements can be a problem due to humidity and bugs or both. Sometimes the ideal can't be found, though, in which case I recommend you not store wool for long periods, but try to keep it moving through your studio. Just make sure you don't use plastic bags for long-term storage. They trap the moisture naturally present even in 'dry' wool, causing it to sweat on the insides of the bag, which can in turn lead to mildewing, felting, and even spontaneous combustion if bacteria start feeding on the wool--more likely with dirty than clean wool, but always something to keep in the back of your mind. I make muslin bags to store my wool, both greasy fleeces and clean wool. A yard of muslin, very inexpensive at fabric stores, will make a large bag suitable for at least 5 pounds of clean wool. Old sheets may be used, too. Patch any holes, to help keep bugs out. Fold the cloth in half, sew up two sides, make a casing on the third edge, pass through a cord, and you have a drawstring bag that will last for years. I mark a large number on my bags--I'm up to 23 now!--using a wide-tip permanent marker, on both sides, so it's easier to identify the particular fleece I'm looking for. In my studio, I keep a card file box filled with index cards to catalog my collection of wool. Each card has a sample lock of washed wool taped or stapled to it, along with information including which bag holds the wool, whether it's washed or grease, who I got it from, at what price and on what date, and its breed (at least in theory--in practice I rarely get quite all that information together :) I also note details about the quality of the wool that might not be noticeable from a small sample--for example, that the fleece is quite soft or a bit harsh. Even after I've used up all of a given bag of wool, I keep the card in a different location as a growing record of different types of wool, and the shepherds I bought the wool from. Keeping bugs away is another concern when storing wool. I've been lucky, or else my muslin bags are a good barrier against insects. Very few bugs will chew through muslin, though mice and other rodents might--consider getting a cat if that's a problem for you :) I've had skeins of yarn in baskets attacked by bugs, but never my bags of wool. I do use lavender in my stored wools, now, because I like the scent. I don't know if that has a deterrent effect on insects or not. I've heard bugs prefer dirty wools to clean, but since I've stored grease fleeces for as long as 10 years, in my muslin bags, with no insect damage, I'm not sure of the truth of that 'fact' either. It's a mystery to me! Shown is a grease Polwarth fleece, a wool very nearly as fine as Merino. One "sausage" is complete, one needs to be tied, and one is just started. Step by step instructions are below. Cut some pieces of nylon netting (illusion or tulle) about 15 inches/40 centimeters by 36 inches / 1 meter. Lay one piece on a flat surface. Along one of the short edges, place 2 or 3 locks of wool taken from your fleece, tip to tip, about 1 inch / 3 centimeters from the edge. Fold that edge of nylon over the wool, then roll the wool up a bit so it's all encased in netting. Lay another row of wool locks, roll up so it's all encased. Keep doing this until you're a couple inches from the other end. Roll the rest of the netting up. Secure the ends tightly with string--making sure you don't tie on top of the wool. You may now wash this wool in very hot water, or even dye it using immersion or microwave techniques (no safety pins in that case), without having to worry about felting or waste due to the locks becoming disarranged. The nylon netting will not be melted or otherwise harmed by boiling water temperatures. When you're done, just drain or spin out the excess water, hang or lay out to dry, cut the strings, and unroll the wool. The washed or dyed wool is ready to comb as soon as it dries. 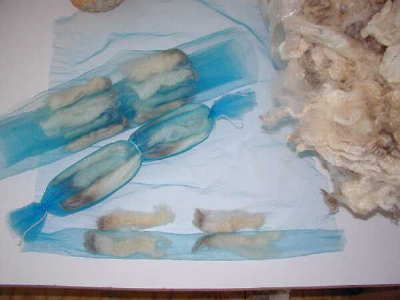 This method may be used to prepare other fine fibers for washing or dyeing--for example, I've dyed angora rabbit fiber this way, with excellent results. My thanks to the members of Fibernet, Ron Parker's email list devoted to the fiber arts, for suggesting this arrangement for washing fine wools. It's taken me about two hours to write this article. In that amount of time, I could have washed an entire fleece and had time left over! It takes much longer to explain washing wool than to do it. I hope this article encourages you to buy greasy wool and wash it yourself. You'll save a lot of money over the cost of having that wool commercially washed and prepared, and you have total control over the process. You will know exactly what was used on your wool, and exactly how it was handled. Quality is an attainable goal when you wash your own wool.